Have you ever had a programmer tell you that they're 90% done? It happens all the time. Don't believe them. I'm a programmer. I should know. You see, there's a funny thing with software. It's very fluid, and can end up being very complicated. For simple tasks, it's fairly easy to estimate the effort required, based on previous experience. An example often used in project management literature is "digging a ditch". Unfortunately there are a lot of people that still try to apply this same logic to software development. It simply doesn't work. Here's why. Let me tell you a little story. Mark the Manager gives Peter the Programmer a specification for a new, complex feature in an existing, complicated piece of software. Mark asks for an estimate, to which Peter replies, "Well, there are a lot of unknowns, but based on the spec, I think 2-3 weeks. Worst case scenario? 4 weeks." Mark would like it done faster, but agrees to the estimated timeline and gives the green light. Peter starts working steadily, 40 hours a week, with no vacation, personal, or sick time. Disaster! What went so terribly wrong? This is such a common curve in software development, it should have a name. If it doesn't already, I propose calling it the "Programmer Optimism Curve" or POC. So what do we do to prevent this from happening? There is clearly no silver bullet solution. 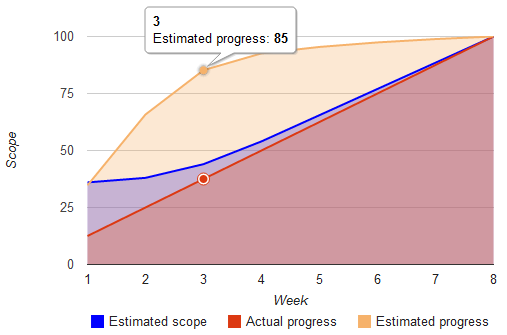 I've written about my 5-step software development estimation method. That can certainly help. The "story point" methodology from Agile can also work well when you have a long project with the same team members. Jeff Atwood has some good suggestions about listing todo items too. Of course, "knowing is half the battle," so now that you're aware of the problem, you can start taking active steps to keep it from sinking your ship.